Base Ten Block Compound Lesson. One of the best things about base ten blocks is they impart so much math so quickly if you know how to best use them. They make math concepts visually obvious. They take the overwhelm out of the equation. Even if the child does get all of it in the first exposure they don't turn off, they usually get curious and find out more. Base ten blocks aren't scary. 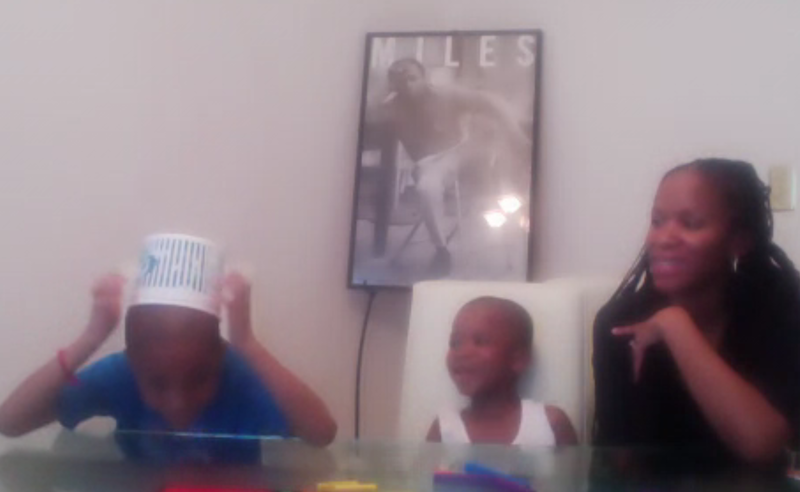 Here is the student with his younger brother and mom playing around during a game of what's under the cup. When I talk about collapsing time frames this is one of the reasons why. We can teach so much at once AND make it EASY to understand. They can SEE how it all goes together. When they see it here they will be used to seeing how it works so when they get other lesson they will be used to making those associations and connections on their own. THE EXACT OPPOSITE of teaching it in fragmented lessons that stress memorizing just long enough to take the test. Segmented lessons that focus on rules and process, axiom and postulate DO NOT give the student an over all understanding of the mathematics and may in fact harm their grasp of how the language of math works.. Here is a feisty six year old who although you can't see him was having a fun time playing math with me over the internet. He was shocked when it was time to quit. Base ten blocks and compound lessons. Try a few with your kids. You won't confuse them by exposing them to math concepts early. This vid starts out a tad rough but give it a minute or two. The video starts out with us building square numbers a really important concept to introduce to little kids. (Do a search, crewton ramone square numbers...see what comes back) This is often overlooked in public schools. And as you can see we cover some basic concepts with regard to squares, WHILE we learning to count and add and multiply. At this point we have been playing for about half an hour...started out building tens and playing what's under the cup. Introduced some simple concepts like want to be a ten and count the big ones first...and then spent time playing with squares and then took a side trip into multiplication (15 x 15, 16 x 14 etc see vid for more, eventually we will get the 20x20 matrix memorized) where the addends for the tens added up to ten, so ten, tens made a second hundred which made the whole thing EASY. This whole lesson is just teaching more counting while remembering bigger is funner.